Etude House Fresh Cherry Tint in Cherry Hot Pink and Cherry Red. Etude House Nymph Aura Volumer in #4 Luminous Nymph Aura. Missha Complexion Coordinating BB Cream in Beige and White. Missha Time Revolution First Treatment Essence. Skinfood wash-off masks: Rice and Black Sugar Strawberry. Missha Misa Gold Snow Radiance eye cream. Too Cool for School Pumpkin Sleeping Pack. 3W Clinic sheet masks: Snail and Cucumber. Entries will be finalized on January 8th, 2016 at 11:59pm EST. I will use Random.com to pick a winner. I want to try Etude House Nymph Aura Volumer, because that name is hilarious. Also, I would like to start dabbling in highlighters. I would have to say the Etude House Fresh Cherry Tints because I'm a sucker for tints and for things labeled "cherry". I love cherries. They all look fun, but I'd love to see the BB creams! Winter really dulls my complexion, so I'd love to try the radiance eye cream! I'd love to try the pumpkin sleeping pack, my skin has become almost painfully dry and any little bit helps! I have always wanted to try the Etude House Nymph Aura Volumer! That BB cream looks interesting too... is it actually white? Thanks for doing a giveaway! missha complexion coordinating bb cream I just want to find something pale enough for me without oxidizing. Ooh nice! I'd like to try the snail mask as I've been getting into snail secretion products lately! 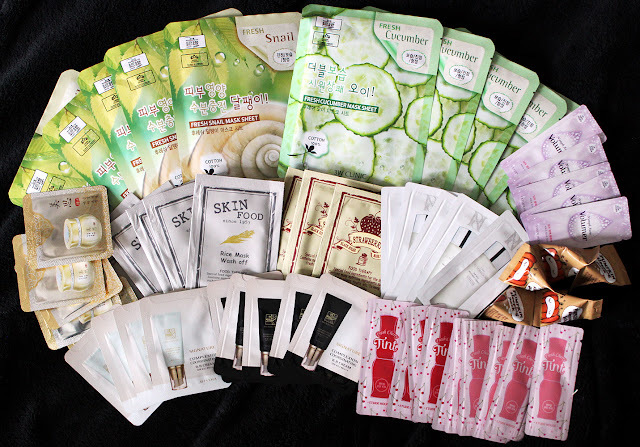 I've almost bought one of those Skinfood masks so many times, hence I'd love to try them in sample format! Ive been curious about the Missha essence for a while now, I keep hearing good things about it. Would love to try the snail mask! I would love to try the Etude House Nymph Aura Volumer! and thanks so much for the giveaway :) I'm a lurker but love the blog, I read it all the time! I'd love to try the cherry hot pink tint!